Alain Bossé’s take on the classic Acadian dish is savoury comfort food at its best. 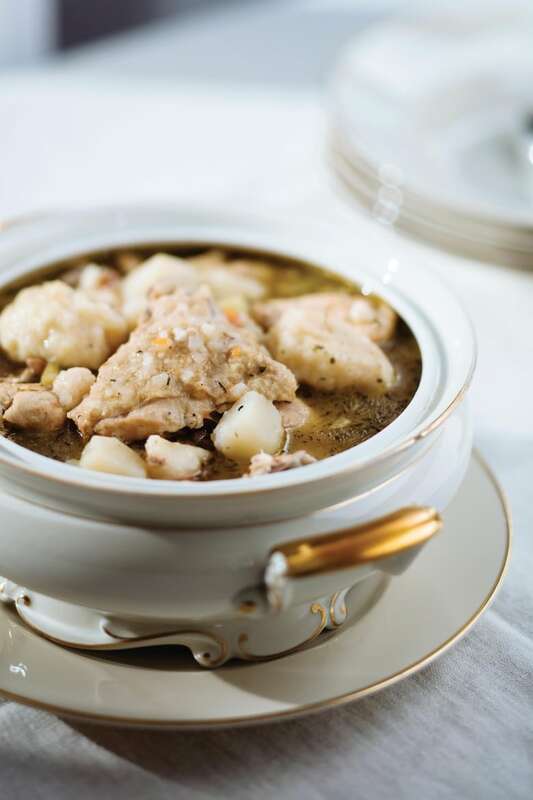 While it may not have as much name recognition outside of the Maritimes, fricot has been a staple in Acadian kitchens for centuries — and it’s easy to see why. With its savoury spiced broth and fillings of meat and potatoes, it’s hearty fare. This version comes to us from Alain Bossé’s cookbook The Acadian Kitchen. Make it with or without the simple, doughy dumplings for a warming dinner to get you through the final stretch of winter. While it is not unusual to see many variations on fricot, this one is different from any other I have ever experienced. I discovered it while doing consulting work in a restaurant in Cheticamp, Nova Scotia. It’s very hearty and easily serves as an entrée with no need for accompaniment. This is my version inspired by the ladies at the Old Cuisine et Artisanat Acadiens. Dredge chicken thighs in all purpose-flour. In a large cast iron skillet, melt 2 tbsp butter. Place chicken in the skillet and sear on both sides until golden, about 3 to 4 minutes; set aside. In a large pot, melt the remaining 2 tbsp butter and sauté onion and potatoes until onion becomes translucent. Add chicken thighs and pan juices and sprinkle with chives, salt, onion powder, and freshly ground pepper. Cover with water, bring to a boil, reduce to a simmer, and cook for 1 hour. You may add Fricot Dumplings to this recipe, if desired. In a large bowl, mix together flour, baking powder, and salt. Use a fork to gradually incorporate milk into the flour mixture. Using 2 teaspoons, drop dough into hot fricot or stew; cover pot and cook for 15 minutes, or until the dough is cooked through. Excerpted from The Acadian Kitchen: Recipes from Then and Now by Alain Bossé. Recipes Copyright © 2018. Excerpted by permission of Whitecap Books. All rights reserved.